The story starts in the 1960s, with the rise of “wargaming clubs”, followed by the evolution of the “medieval fantasy genre”; here we’re treated to descriptions of the types of creatures/characters, economics, and equipment of such games. Peterson then includes chapters about the rules and systems of these games, and the characters, roles, and immersion instrumental to the gameplay. He moves on into the “dawn of role-playing” in the ’70s, which seems fascinating, before concluding with an epilogue entitled “Role-Playing and Reality”” that hints at the influence these sorts of games had on video games and virtual worlds. 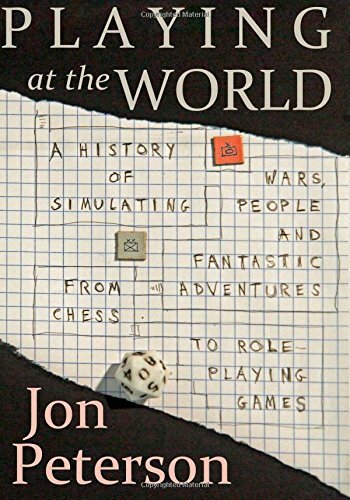 The book’s subtitle is: A History of Simulating Wars, People, and Fantastic Adventures from Chess to Role-Playing Games — but upon closer look this book seems to be almost entirely about a pretty specific time and genre: 1960s–‘70s; RPGs of the Dungeons and Dragons flavor. I can’t fault the book for this constraint, as it looks utterly fascinating in its niche way, but part of me wishes there was a bit more on the longer, more complex historical influences and greater varieties of games, simulations, and role-playing (e.g. earlier influences like perhaps improvisational comedy and theater, and later threads like “Second Life”-type virtual reality worlds). Maybe some of that stuff is in here and just not surfaced in the TOC. But the focus is probably actually good; this kind of thing does require a certain obsession. It’s more complex than just the origin story of any specific game; it’s also a work of historiography and cultural critique. And perhaps most interesting (at least to me) — it does also seem to use the more specific phenomenon of the ascension of role-playing games as a lens through which to explore some interesting shifts towards more immersive, interactive experiences of fictional worlds.